caaa-razy awesome february group GIVEAWAY. sponsor love + giveaway with Rags to Stitches. CLOSED - sponsor love + giveaway with Shopkempt. to agree to disagree on red velvet cake. i made a creative decision this year. 7 things on mah mind. sponsor love + giveaway with Stitched + Adorned. sometimes i wish i owned a pet tiger. sometimes i dream about having a big house with me and ryan and our 10 kids (9 girls and 1 boy). sometimes i dream of a little studio apartment with just me and ryan forever (then we would never have to mow the lawn). sometimes i think it'd be fun to have pink hair. or red. or maybe blue. sometimes i come up with the best blog post or project epiphanies in the middle of the Sunday morning church service (sssshhh!). sometimes i have to check my bathroom 3x to make sure the straighter is unplugged before leaving my house. sometimes i wear red lipstick and feel like a model. sometimes i wear red lipstick and feel like a clown (so i wipe it off on those days). sometimes i think i'd like to be more athletic. sometimes i wish i wasn't so disorganized. sometimes i sing really loud in the shower and pretend i'm Adele. sometimes i wish i ate healthier. sometimes i talk in a British accent because i think it makes everything all the more fun. wouldn't you say, old chap? sometimes i wish i was 5'10 instead of 5'3 but then i remember i probably wouldn't wear my big heels as often and i wouldn't be the perfect height for Ryan's hugs. Love that lipstick! My cousin actually worked at a big cat insync a few summers ago (she's a vet now). And it was as if she had her own pet jaguars, cougars and tigers! Sometimes I wish I was 5'4" and not 5'9" not only b/c I am a giant when I wear my heels, but also skirts and dresses wouldn't be as short as they are w/my long legs! Thanks for stopping by my blog. It means the world to me! Love this. And can agree with most of them! happy weekend sweet pea! oooh I have to try some of the revlon lip butters! Once I run out of one of my current lipsticks that will definitely be one of my immediate purchases! 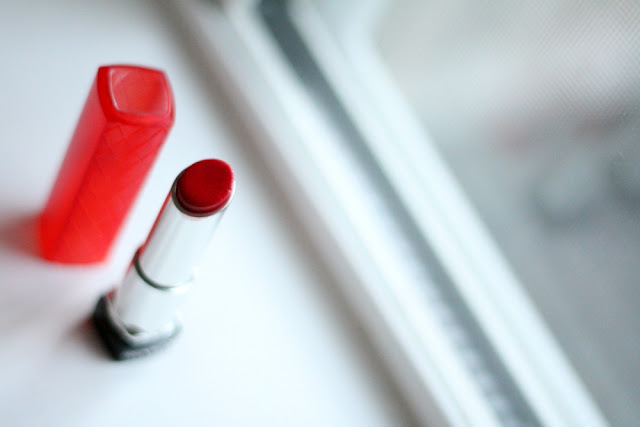 the way you feel about lipstick is spot on. I have been wanting to branch out in the red lipstick department. I feel like a clown when I wear it. I need to get over this fear, put it on and rock some red lipstick!! Right?! Ilene I LOVE this post! I may have to steal (borrow!) it from you if you don't mind! P.S. Tomorrow I'm having a giveaway, drop by and enter! P.S.S. Short girls have WAY more fun. Sometimes I fall in love with your blog all over again, and its because of FUN posts like these! wait--you are only 5'3"? You look super tall in your pics...I kinda can't believe it! hey... checking the straightener 3x is a good thing!!! i get too confident in my one check and end up leaving it on for hours. yipes! I gotta be in the right mood for red lips. Usually I pair it with cat-eye liquid eyeliner and I feel like an old Hollywood movie star! I see this brand of lipstick in the stores, and always wonder about it. Is it opaque? or more of a sheer red? Ha, I'm 5'8 and wouldn't be caught dead in heels. trust me, you def wouldn't wear heels as often haha. and i also talk in a british accent... like, a lot. and i'm terrible at it which makes it more fun. Your posts always make me smile :)Thanks for being open and real with your readers! Drop by my end of the blogosphere and say hi sometime! Love this post! 9 girls, huh? Well, at least you'll have one boy to spoil all the time. you are soo cute!! and i wish i were shorter so i could wear those 5" heels!!! love u! and i overly check the kid's breathing at night. just to make sure their little bodies are moving up and down. and all the carbon dioxide monitor lights. just to be sure they are all working properly. total paranoid person over here:)...love your list! too cute! BTW i check like 5 times that my straightener is off before i leave all the time! love the lipstick illy! sooo pretty! I really lovo what you wrote...sometimes I feel like this too! Sometimes, I wanna dye my hair blue, but my mom would surely freak out. Haha. Oh my golly,10 kids?? Have mercy on your uterus,dear. I think 3kids would be fine. Lol. Sometimes I check the door several times to make sure it is really locked before I leave the house. Have a fantastic weekend doll!! And .... why only ONE boy?? Little boys are the greatest. There are no complex emotional tangles to sort through -- just energy and nonstop amusement, haha. A girl in my dorm freshman year burned her room to a crisp leaving on a straightener...better safe than sorry! 9 girls and 1 boy!? :) i wanted 12 kids when i met josh 8 years ago... now i'm down to 4-6... ask me in 5 months and maybe i'll be down to 2 ;) haha! nah, i love kiddos!! hehe 9 girls & 1 boy?! ;) I always come up with new ideas in the shower! I once saw a marker or something you could write on the shower with. I need that! hehe. Because I ALWAYS forget my ideas after!!! Cute! I love this post. OH love this, I sing like Adele too, well I pretend to sound like her that is, haha. LOVE HER. I'm 5'2 (short!!!) but I wouldn't want it any other way! Getting to wear any shoes you want is a bonus right there! i love this "sometimes" post. :) makes me wanna make one! What a wonderful blog, I am happy to have stumbled on it. I love your outfit in the post below, you look gorgeous! I love this post! And I'm with you on the red lipstick - model some days, clown others. xo!! Illy, I don't think you could be any cuter if you tried! Oh and I totally rock a British accent from time to time too! You are way too adorably fantastic, lovely! I loved reading your sometimes list!! I wish I was 5'10 too! Revlon Lip Butters are awesome. I want to get Candy Apple too. I have been using Lollipop lately.